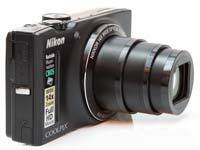 The Nikon Coolpix S8200 is a new travel-zoom camera featuring a 14x zoom lens with a versatile focal range of 25-350mm. Measuring just 32.7mm thick, key features of the S8200 include a 16.1 megapixel back-illuminated CMOS sensor, high resolution 3 inch LCD screen, full 1080p high-definition movies with stereo sound, lens-shift Vibration Reduction, 1cm macro mode, shooting mode dial and a fast auto-focus system, shutter-lag and startup time. The Nikon Coolpix S8200 also offers target-finding auto-focus mode, Easy Panoramas, 6fps continuous shooting at full resolution, in-camera HDR imaging, a range of special effects and advanced Night Landscape and Portrait modes. Available in three colours, Black, Red and Gold, the Nikon Coolpix S8200 costs £279.99 / €325.00 / $399.95. The Nikon Coolpix S8200 is almost identical to the S8100 model that it replaces, so a lot of the comments that we made about that camera apply equally to this latest release. The Nikon Coolpix S8200 has a rather conservative yet still appealing design, with the metal body finished in a glossy black coating that's helpfully rubberised on the front half, aiding your grip on the camera. Although very slightly thicker than the S8100, the S8200 is still very slim for a camera with a 14x zoom lens, but note that the camera does measure over 70mm deep when the zoom is fully extended. At 213g it's also quite a light camera, and just about fits in both the palm of your hand or a shirt pocket. The new 14x lens dominates the front of the S8200 and has an attractive rounded appearance that helps distinguish it from rival models, as does the neat pop-flash which automatically appears whenever a flash mode is selected. Otherwise the design is pretty conventional, with nothing to surprise or scare anyone who has used a digital camera in the last five years, making it easy to get up and running in no time at all. That's certainly helped by the S8200's lightening fast reflexes. Start-up time is almost instant, with the camera ready to go in less than half a second, making it one of the faster compacts that we've tested recently. The S8200 also is something of a speed demon when it comes to focusing on your subject. The 14x zoom lens provides a versatile focal range of 25-350mm, impressive given the overall size of the camera, and is wide enough for landscapes and has more than enough reach for candid portraits. The lens has a fairly fast maximum aperture of f/3.3 at the wide-angle end but a rather slow f/5.9 at full telephoto. The Nikon S8200 is very quick to find focus, locking onto your target in less than 0.2 seconds, regardless of the lighting conditions or which end of the zoom range you're using. In addition, the target-finding auto-focus mode successfully detects, tracks and focuses on the main subject, making it easier to capture fast-moving subjects successfully. Nikon have included their excellent VR (Vibration Reduction) image stabilisation system to help prevent camera-shake, an essential feature nowadays, which is turned on and off in the Setup main menu. In practice the VR system makes a noticeable difference to the sharpness of the images, as shown in the examples on the Image Quality page, but don't expect to get sharp results every time at the longer focal lengths without the use of a suitably fast shutter speed. Thankfully leaving the anti-shake system on didn't reduce the battery-life too much, with the camera managing just over a 250 shots using the supplied Lithium-ion rechargeable battery. The S8200 can be charged using the USB socket on a computer or via the main power using the included AC adapter. In addition, there are a range of other functions and modes that also help to prevent camera shake. High ISO light sensitivity up to ISO 3200 at full resolution throughout the range reduces the risk of blurred images, while the Motion Detection option automatically detects and compensates for both camera and subject movement. The Best Shot Selector (BSS) mode automatically selects the sharpest of up to 10 sequential shots. The Night Portrait mode takes consecutive shots which expose the portrait subject and background separately, then immediately combines the exposures to create a blur-free portrait. The Night Landscape mode combines a series of five consecutive shots taken at a fast shutter speed into a single image with reduced noise, useful when taking handheld shots. The Backlighting mode offers an in-camera high dynamic range (HDR) function, merging several images of the same scene to achieve a single image with a broad range of tonal detail. All of these options and the Vibration Reduction system can be used at the same time if so desired. There aren't too many external controls and buttons (just 13 in total) on the Coolpix S8200, reflecting the fact that this is a point and shoot camera with no real manual controls. On top of the camera is the pop-up flash, left and right stereo sounds mics, small recessed On/Off button, shutter release button and tactile push/pull zoom lever. There's also a handy Shooting Mode dial with 8 options, which means that you don't have to use the main menu just to change mode, and it has a positive action to prevent unwanted movement. There are 18 scene modes to choose from, including the clever Scene Auto Selector, which automatically recognizes the scene in your picture from 6 presets (Portrait, Landscape, Night Portrait, Night Landscape, Closeup and Backlight) and adjusts the camera settings accordingly. New to the S8200 is the Effects mode, which shoots both still images or movies using a special effect, such as Soft Focus and Nostalgic Sepia. You can also use one of the in-camera filter to enhance your photos after you have taken them, with filters including Cross Screen, Fisheye and Miniature. On the bottom the S8200 has a memory card slot allowing the use of either SD, SDHC or SDXC cards, and there's also 32MB of internal memory, which can store 5 images at the highest quality level. The memory card slot is shared with the battery compartment. There's also a metal tripod socket which is inconveniently located in the far-left corner of the camera. The rear of the S8200 is quite traditional in design, with all of the controls located to the right of the large LCD screen. The large 3 inch LCD monitor has a excellent resolution of 921k dots, resulting in a detailed and vibrant display that puts standard LCD screens to shame. It also offers five levels of brightness, an anti-reflection coating and a wide viewing angle. There's a round navigation wheel and a central OK button to the right, surrounded by two buttons above and two below. The navigation wheel is a nice touch that can be used to scroll through menu settings and pictures, but doesn't really serve any other purpose. The four corners of the wheel also double up to access the flash, exposure compensation, macro and self-timer settings (starting at 12 o'clock and going clockwise). Above the navigation wheel is a button for playing back your images and there's also a handy dedicated button for starting and stopping movie recording (more on this below). Below the navigation wheel are the self-explanatory Menu and Delete buttons. Unfortunately there's no quick way to change the ISO speed or other key settings, forcing you to delve repeatedly into the menu system. D-Lighting is a long-standing Nikon technology that brightens the shadow areas of an image, and on the S8200 it can be applied to an image after it has been taken. Face-priority Autofocus can detect up to 12 faces in a scene just so long as they're looking directly at the camera, whilst In-Camera Red-Eye Fix automatically processes the picture to remove red-eye. Blink Warning alerts you if someone in the frame had their eyes closed, and the Smile Timer automatically takes the picture when a smile is detected. The Skin softening function magically makes your subject look 10 years younger by smoothing out any perceived imperfections, and the Creative Slider instantly adjusts the brightness, saturation and colour tone of an image. 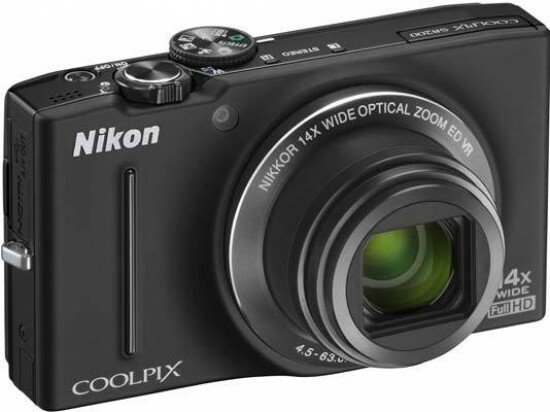 The Nikon Coolpix S8200 can record full 1080p HD quality video complete with stereo sound. It offers 1920x1080, 1280x720 and 640x480 pixel movies at 30 or 15fps, and 320x240 pixels at 15fps saved in the Quicktime .mov format. There's also a range of high-speed options available - 120, 60 and 15 fps - which give your movies a slow-motion effect. An HDMI Mini port allows the S8200 to be easily connected to a HDTV, although no suitable cable is supplied in the box. You can also use the 14x optical zoom lens during recording, complete with the optical vibration reduction system and autofocusing, also the lens is painfully slow in operation, presumably to avoid recording the noise of the zoom mechanism. The S8200 is capable of capturing an impressive 120 or 60 frames per second, but sadly only at VGA and 1 megapixel resolution respectively. The standard continuous mode can shoot at 6fps at full 16 megapixel resolution, which is a good performance for this class of camera. The camera's pre-shooting cache mode can record up to two shots before the shutter-release is fully pressed. There is also a Multi-shot 16 mode that quickly takes 16 low-resolution photos and arranges them into a single image. Once you have captured a photo, the Nikon Coolpix S8200 has quite a good range of options when it comes to playing, reviewing and managing your images. You can instantly scroll through the images that you have taken, view thumbnails (up to 16 onscreen at the same time), zoom in and out up to 10x magnification, apply D-Lighting, the Skin Softening feature, 4 different Filter Effects and Quick Retouch (improves the contrast and saturation), set the print order, view a slide show, delete, protect, rotate, hide and copy an image, plus create a smaller version and choose your favourite images. The Monitor Settings menu option toggles between various views, including showing detailed settings information about each picture, such as the ISO rating and aperture/shutter speed, framelines and no information. Unfortunately there is no histogram available during composition, but a small one can be displayed during playback with a press of the OK button. If you have never used a digital camera before, or you're upgrading from a more basic model, reading the well-written and easy-to-follow manual before you start is a good idea. Thankfully Nikon have bucked the recent trend of not providing hard-copy manuals by supplying it in printed format.